We would like to have a 10 X 12′ gable building constructed. Our home is in The Havenwood Subdivision, North of 306 off Hunter Road. The address is 2166 Ranch Loop Drive. Does someone need to come look at the building site? How soon could you start? Interested in 8×12 to be used as small office. 36×48 window and small standard door on same side as window…door/window on the 12′ side. Do you take payments, or do you have to pay in full? I am pricing a storage building/outdoor kitchen combination. The storage building could measure from 10′ x 16′ up to 12′ x 20′ with a 10′ x 12′ porch extension off of one 10′ or 12′ end for a covered outdoor kitchen. It will have to be built onsite. Electricity and water are available at the site. Very little leveling will be required. Just give me a call, I would be happy to bid on your project. Can I choose the roof shingles type and color? HOA requires shingles that match house roof. You built our building for us in Bastrop,would you travel to Edna tx area to build us a building? We need a 12×10. Can you give us a total price? Sorry Edna is a too far. I live up close to Abilene so Austin is about as far south as I go…. I couldn’t find your email on this site, but I’m looking for a quote for a modern single pitch roof storage building. 10×16 with double door. Just for storage now but hoping for the capability of turning it into a studio in the future. All prices on this website are current, if you are looking for a custom building please send me a picture or drawing of what you have in mind. do you do any electrical wiring for an interior light? No… any electrical work must be done by the homeowner or a licened electrical contractor. Hi Jerry, you have built two sheds for us over the years and we would like another one at this time. 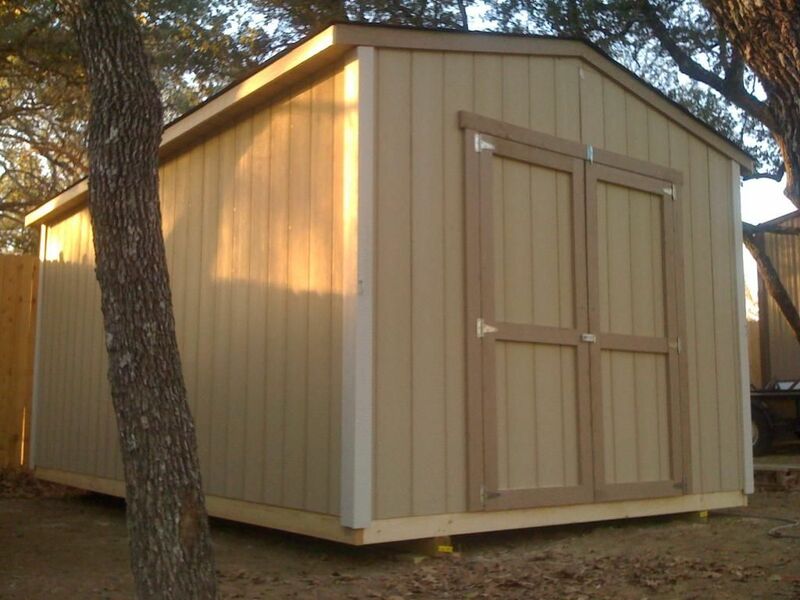 Preferably gable shed 6′ x 9′ with sliding door (if that’s possible). would you please give us a call to discuss details and cost. we are located in north Austin/Round Rock area.